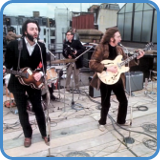 Inspired by J. S. Bach’ ‘Bourree in E minor’ and a bird waking him up in the morning, Paul McCartney created a modern masterpiece in ‘Blackbird’. A constant open G string, variations in a progression like IV – IVm and a change of key for the chorus, are the three main things you need to focus on to learn it. There are seemingly two dim7 chords in there as well, although, upon closer inspection, only a fraction of a C#dim7 is actually used. The second suspected dim7 chord, starting on a D# is not even minor, it’s a D#(b5), an altered chord. Get the full story of the entire arrangement, complete with TAB, in the advanced course. The open G-string is used throughout ‘Blackbird’, giving the piece a ‘drone’ effect that ties the progression together. 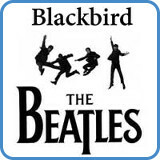 In the advanced course, we look at all chords of Blackbird. Throughout ‘Blackbird’ you’ll find different time signatures appearing. The most obvious one is the verse that starts in 3/4 for a bar, changing to 4/4 immediately. This 3/4 time for a bar concept appears several times, there is also a 2/4 bar hidden in there. ‘Blackbird’ is mainly in the key of G but it does modulate to F for the chorus. The modulation is abrupt as it starts, making the first F feel like a bVIIx chord in relation to G.
To get back to the key of G, we play A7 – D7, in the key of F that’s IIIx7 to VIx7. In the key of G, they are IIx7 and V7 chords. Unique to ‘Blackbird’ is the strange index finger strum technique. This is a homemade technique I’ve never seen before or since, which is strange as it’s so brilliant! Combining the thumb plucking and strumming strings using a downward motion, the index finger strums the upper part of the chord up and down. In the advanced guitar course, the index finger strumming is fully analyzed with TAB and rhythms. For complete lyrics, go to Blackbird lyrics.